What Bracha do you make on Lasagna? The Bracha on lasagna is questionable since lasagna consists of wide pieces of dehydrated dough. The noodles are cooked and then the sauce and cheese is baked in an oven altogether. The Shulchan Aruch (168:17) says the Bracha for such a food is Hamotzi. 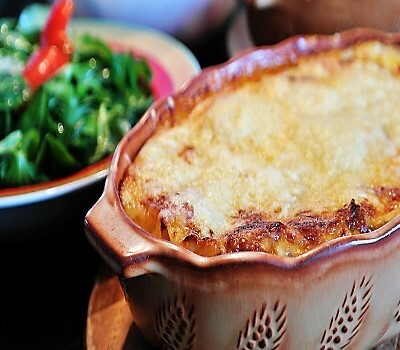 Lasagna is not comparable to regular noodles which are thin and not as tough. It would make sense that if the lasagna has a dry look to it then one should wash beforehand, and if the lasagna has a wet look to it then a Mezonos is made, since it may not look like bread. Most lasagna today have a wet consistency and therefore a Mezonos is required (Horav Yisroel Belsky Shlita).